So during the first week and a half in Australia, while the wife and I were trying to gather things together, we did not have a proper Internet connection. And to make matters worse, the computers that we used to go online did not all have a USB drive to save any screenshots / webpages that we wanted to keep for reference. Thus in order to ‘save’ any information we found online we had to resort to taking photos of the screen. Having them in the dedicated digital camera would be good as it would be able to keep high resolution photos of the information, however it would be a hassle trying to retrieve as we filter out which photo corresponded to which piece of information we would be looking for. So I resorted to my trusty phone, a Nokia E71, to take photos of the screen: not the best quality photos but the functionality that the phone provides, allowed me to gather the information and sort them out properly. This method would work in Android as well since you have access to the fie structure via a file explorer which typically is already installed in the device.There could be a way to do this on iOS, but an application would probably be needed and my efforts of asking around came to nothing (probably time to get an iOS device myself). What would have been perfect of this situation would be the ability to tag photos. Tagging would allow photos to be categorized in several categories (e.g. a picture of a map of bus routes can be tagged under “map” and “transport” while maintaining a single copy of the file, as opposed to copying the same file into different folders in a file/folder structure). Browsing photos by a tag would allow quick retrieval. I was surprised when I discovered that Symbian (or S60 as most people refer it it as) was the only phone OS to have tagging out of the box: iOS and Android do not have them out of the box. 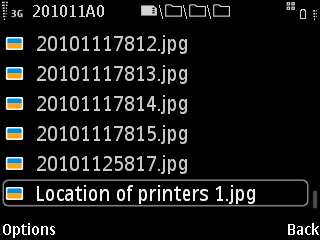 It seems that Symbian has had tagging since the N97 based on this ‘How to Organize Photos on N97 & Mini with Tags” article and thus probably started with Symbian OS 9.3 (as my E71 running 9.2 does not have it). Another side note: the N8 running S^3 also has this tagging feature. I did find that Evernote does support tagging and is available for iOS and Android. It’s meant for organizing data (photos, notes) however it does require an account and Internet connection (when setting it up) and could be a hinderance. 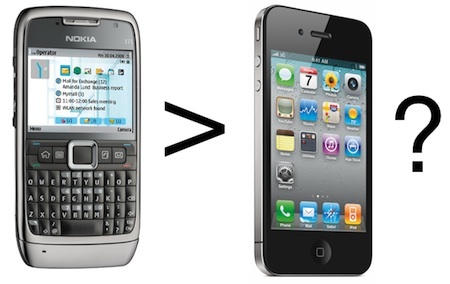 It was the discovery of an Nokia E5 running an old smartphone operating system that made me go back to Nokia’s newest catch phrase of “It’s not technology, it’s what you do with it” because if you talk about buying a smartphone these days it’s basically iOS (in the iPhone) or Android (in many different Android phones). 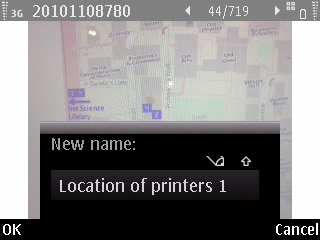 However, neither of these platforms can do tagging out of the box like Symbian can. It is always about what you can do with technology and not just about the hardware/software by itself. Technology should always be an enabler: helping you do to things. It is always great when you can make a device do something it was not able to do before: e.g. magnifying glass for macro photos on fixed focus camera phones or using a blacked piece of film to take photos of a candle (shown to me by @nickthien). So I put forth to all you readers that you take a look at your gadget and see what added functionality you can get out of them. Explore and make full use of your technology. Live long and prosper! Next Post Microsoft Office Phone Activation Fail. Proxy server WIN!